cpcfriends BLOG: A New Thing! God is moving in and around the ministry of Crisis Pregnancy Center of Tidewater (CPC) like never before. He is doing a New Thing that will promote LIFE more than ever and weaken the abortion industry in our community. If you skip a paragraph, you will miss something. So please stay with me until the end. Pregnancy Medical Clinic in the city of Chesapeake in 2016! This new clinic, like CPC's other clinics in South Hampton Roads, will offer life-affirming ultrasound in the context of the unconditional love of our staff and volunteers. This LIFE-revealing clinic will make a significant impact on the hearts and minds of the women considering abortion in our community and it could not come at a better time. One More Clinic, More Lives Saved. South Hampton Roads used to be the number one region for abortion in all of Virginia. However, that is no longer true. 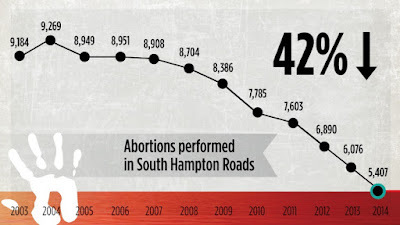 The number of abortions in South Hampton Roads began to reduce in 2005, the year CPC opened its first pregnancy medical clinic in the city of Norfolk, and the reduction in abortion has been in the steepest decline since CPC opened its second clinic in Virginia Beach. We are looking forward to seeing more lives saved as a result of this new clinic in Chesapeake! has dropped 42% in South Hampton Roads. As a result of the remarkable drop in abortions locally, the abortion industry has been crippled here. One Norfolk abortion facility closed in 2013 and others are struggling to stay open. This is a critical moment in our community. Opening CPC's new pregnancy medical clinic in Chesapeake as soon as possible will help keep the momentum towards LIFE and possibly close another abortion facility soon. One more clinic, more lives saved. 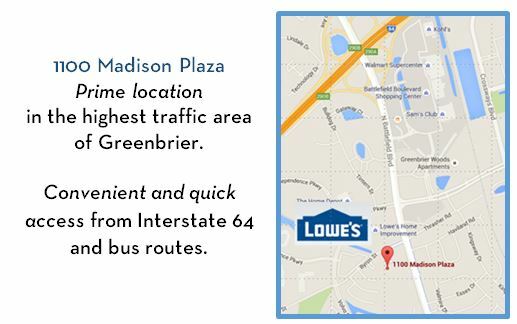 CPC's new clinic will be located in the Greenbrier area of Chesapeake. Greenbrier is a hub of commerce and activity in our region. It is convenient to all cities in South Hampton Roads, giving CPC the opportunity to reach many more women and families at risk for abortion like never before. One of the greatest challenges with Greenbrier is finding a place that will fit the needs and budget of the ministry. 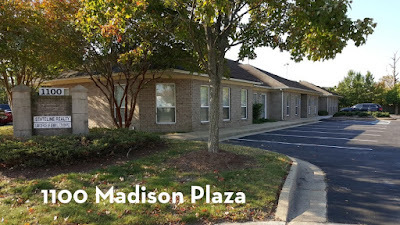 However, we found one property that is in a prime location within Greenbrier, with enough space for the new clinic, CPC's Helpline call center, and the administrative offices. We were able to negotiate a purchase price that enabled CPC to own this building for less than the rental price of ccomparable space. On October 20, 2015, CPC purchased 1100 Madison Plaza. Although it will save the ministry thousands of dollars to own this building rather than to rent a comparable space, acquiring the property presented a significant financial challenge. However, a couple who has a heart for this ministry and is excited about the vision of the new clinic provided a gift of $100,000, which covered almost all of the down payment for the new building. How awesome is that?!? God is doing this New Thing faster than we could have ever imagined!! When we announced our intentions to open the Virginia Beach clinic, it took five years to raise the necessary support and open the clinic. We are on track to open this new clinic in Chesapeake less than a year after making our first public announcement at this year's benefit banquet in October. Only God! There are many details to tend to between now and the opening of the new clinic. Soon we will be hiring and training new staff and beginning the necessary renovations on the new building. The build-out will be significant, but construction should be complete early in 2016. A need still exists for additional funds. Between now and December 31, 2015, the goal is to raise $150,000. In addition to the needs of the new clinic, there are several urgent needs for our existing pregnancy medical clinics and resource centers. These needs have to be addressed prior to opening the new clinic. We are working towards significantly upgrading the security systems at all of our locations. Safety for our staff, volunteers and the women and families we serve is a priority. In this day and age, all organizations must be vigilant. However, the nature of our ministry heightens our vulnerability to additional threats. We do not operate in a spirit of fear, but it is prudent to take more precautions. Also, we have an urgent need for more staff support in our existing clinics. As you know, the work of this ministry involves life and death decisions and time is of the essence. Let's not put a decision regarding life in jeopardy because we did not have enough trained and dedicated people in our clinics. As this ministry grows, we must properly sustain it. These needs are so pressing that we cannot wait until the end of the year to address them. We are moving forward now. If you could send a gift today, it will help make the new clinic a reality while providing for these urgent needs. You may give your gift online at cpcfriends.com/NewThing. God is doing a New Thing! Can you tell? Although thousands of precious lives — created by Him — are still being extinguished by abortion each year in South Hampton Roads, God has not given up on us. He is making a new river in our desert by opening the pregnancy medical clinic in Chesapeake. We look forward to seeing many more lives saved, more hearts spared and the Gospel of our Lord Jesus Christ furthered as a result. Much more has happened in recent months than I can share in the confines of this letter. I look forward to seeing you at a tour of the new clinic where I can share much more. We hope to hear from you soon and please be in prayer for all the preparations made for this New Thing! We praise His name for opening the doors (literally!) for this new clinic to serve many more women in Chesapeake. We praise Him for supernaturally providing the funding for the new operation, and pray for all necessary funds to operate ALL centers going forward. With love and respect for all you as a staff are doing to make this happen! So very excited for yet anither door that is opening for CPC . God sends His mighty warriors out to protect the helpless women and children and I certainly know, He has made you one of those warriors ! It will be done in His name and to Glorify Him.